Samsung’s Gear series of smartwatches is responsible for many remarkable and innovative products. Launched back in 2015, Samsung Gear S2 is one of the most powerful and advanced smartwatches available in the market. Samsung Gear S2 is loaded with a lot of power packed features. It can be paired with both Samsung and non-Samsung smartphones running on Android 4.3 or above and having at least 1.5GB of RAM. Let’s not waste time and jump straight to a brief insight of the Samsung Gear S2. As we know, Samsung has launched Gear S3 frontier and Gear Sports. Now, Samsung has announced the model number Gear S4 (SM R600). 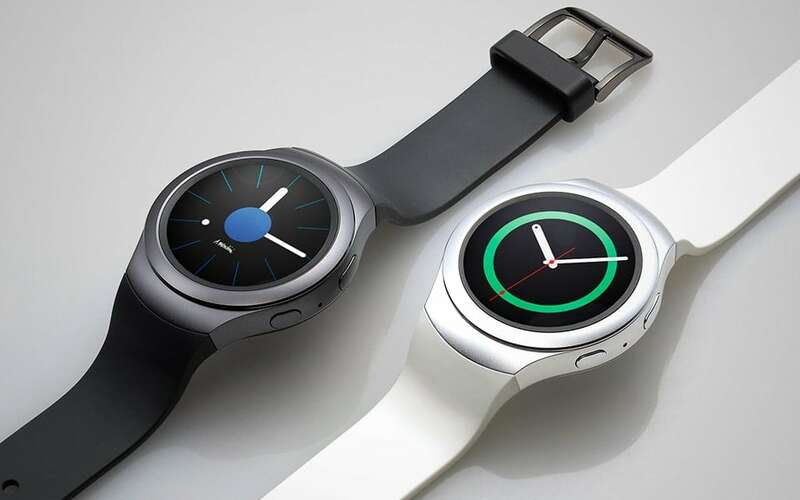 Samsung, for the very first time, presented a smartwatch with a round dial and screen. It comes with a metal case with a brilliant finish, giving it a futuristic look and a premium feel to the user. It also has a rotating bezel controller which can be rotated in both the directions, which eases navigation through the interface. On the other side of the watch, there are home and back buttons. A 1.2 inch 360×360 touch display with AMOLED screen adds to its looks which in turn is protected by Gorilla Glass 3. It has a rubber strap which goes well with the IP68 dust and water resistance. The whole watch weighs 47g and is just 11.4mm thick. A powerful dual-core Exynos 3250 SoC processor is added to the watch. It comes with 512 RAM and 4GB of internal storage (only 1.9GB is user accessible). The 250mAh battery powers the watch, of which, Samsung claims to last 2-3 days. It also features a battery saving mode. It supports Bluetooth 4.1, NFC and Wi-Fi connectivity. The other hardware features include an accelerometer, a gyroscope heart rate monitor, barometer, and ambient light sensor. Instead of just measuring calories, it will measure the amount of activity done throughout the day. Gear S2 also features wireless charging, which really eases the work for you. Just put the watch on the wireless charging dock and it pumps life to the battery of the smartwatch. Samsung’s very own OS, the Tizen is the operating system currently being used by Samsung for all of its smartwatches and Gear S2 also uses the same. The Tizen OS has a circular interface, which looks pretty good and goes well with a rotating bezel and a round smartwatch. All the inbuilt menus are well built with a round screen mindset and a rotating bezel enables easy and simple navigation throughout the interface. Easy navigation means one click or swipe takes you to the radial apps menu, a swipe to the down shows the battery life and other connectivity options, a right swipe shows the notifications and to the left, your widgets will show up. The best part is that the rotating bezel present in the watch can do all these tasks. The setup process is quite easy, but you have to download two extra apps from Google Play Store in order connect Gear S2 to your Samsung smartphone. But after the setup, Gear app is used to do everything with Gear S2. The only lag the Samsung Gear S2 possess is the lack of Apps. There are some basic default apps such as the counter, weather, heart rate monitor, scheduler, music controller and fitness tracker. Other apps include calendar, alarm, S health and Flipboard powered news widget. There are very very few other useful apps. Apps for Samsung Gear S2 can be found on App store in Gear S2. As far as the design and performance are concerned, Samsung Gear S2 is a tough competition to every other smartwatch out there. But the usability of the watch is very limited. The smartwatch is basically just for health monitoring and music controlling. Samsung Gear S2 could beat any other watch in every competition but the lack of apps is a major pull to the drawing side.